13 and 5 years ago we could witness unusual occurence, when inferior planet crossing the solar disk. Transit of Venus is a very rare celestial phenomena, which occurs usually twice in the span of a little bit more than 1 century. I said twice because between first and second transit is approximately 8 years After this 8-years pair of transits occurs a long gap with 105.5 and 121.5 years period. It makes the transit of Venus one of the rarest of predictable astronomical phenomena. Whole Venus transit cycle repeats every 243 years! This occurence takes place, when the planet Venus passes directly between the Sun and superior planet like Earth. This is like annular solar eclipse in miniature, hovewer the Venus antumbra is vast, making this event much longer (over 6 hours). Venus subtends up to 64” arc only, so it looks 32x smaller than solar disk. The Venus orbit is inclined by 3,4 deg relative to Earth’s so very often this planet appears to pass under (or over) the Sun at inferior conjunction. In this case Venus can be as far as 9,6deg from the Sun when viewed from Earth (Pic.1). Pic. 1 Comparison of Venus and Earth orbit inclinations (wikimedia.org). I was fortunate to see last both transits in 2004 and 2012. In 2004 I had a Newton aperture telescope made by OPTUS in Germany. My father bought me this telescope for Santa Claus in 1999. It has 76 mm aperture and 700 mm focal length. I used also 3 eyepieces, through it I could gain 34x, 56x and the 175x zoom. In order to watch the Sun I used self prepared shading filter made for the magnetic coated plastic disk, consisted 3,5 inch floppy disk (Pic.2). Using double layer of this plastic piece enabled me to look for the Sun safety (Pic. 3,4). 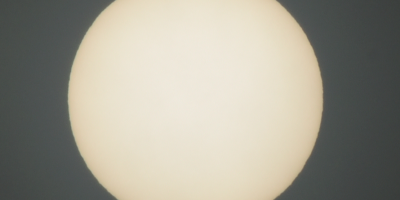 I installed this on the front of my telescope objective and observed the Sun. On that day Wednesday 8th June 2004 the transit was visible for its entirety in Poland. My observation point was situated nearly my home. 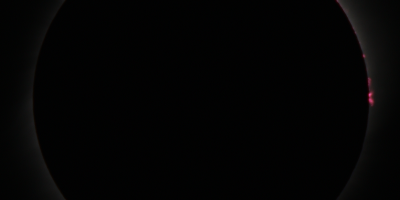 I invited 3 friends and we were watching the Sun with Venus together (Pic. 5). Pic. 2 Magnetic coated plastic disc as a part of the 3,5 inch floppy disk may be use also as an good shade filter (wikimedia.org). Pic. 3 Proper place to install the Sun filter on your aperture telescope. Always remember to put it a front of your focal length! In this case you are making your eyepiece safety with your sight at once. Eypiece “receives” a filtered sunlight (wikimedia.org). Pic. 4 My VT 2004 observation solution. I put solar filter made of a double magnetic coated plastic disc. Therefore I could see reddish solar disk on black background through my eyepiece. Pic. 5 Visualisation of our observation place. I brought my gear (Optus aperture telescope, the Berkut binoculars, shading glasses), bottle of water and also prepared a wooden bench to seat. I had a 10×50 binoculars made by BERKUT also and shading glass. I started the observation just after 7 am and finished around 10.30 am and then went to school to my classes. It was my first school truancy in my life! However I decided that nothing is more important than rare Venus transit, which probably I will not see again (I knew about VT 2012, but nothing is a sure thing). Me and my friends were seen Venus moving across the solar disk, although we could not spot both I and II contact due to altocumulus clouds, which were prevailing above eastern part of the horizon. The VT 2004 is the phenomena, which I clearly remember, although I haven’t got my own pictures from that time. I attached the graphs, which show what I remembered. I can recall a dark circular shape situated near vast solar disk edge. There were a few altocumulus cloud spots, which partially spoiled the Sun. I could see the Sun in 2 colours: red seen through the disk pieces and green through the shading glass (Pic. 6,7). Pic. 6 My memorozed images of the VT 2004 seen through the OPTUS aperture telescope using shade glass. Pic. 7 My memorized images of the VT 2004 seen through the OPTUS aperture telescope using double magnetic coated plastic disc. Weather improved around 7:45, around 5 minutes after II contact. Hence each top left memorized picture shows Sun veiled by mid-level clouds. Around 10.30 mid-transit occurred. I could observe progressing Venus in reverse sequence, but I had test in chemistry at school, which would decide about my final school grade from this subject. I took off my gear then brought it to home, next backpacked and went to school. This rare celestial event was clearly visible from my hometown thanks to nice weather. I took the shading glass to school with myself and finally corrupted a sport lesson a bit. We were doing exercises outside on the school pitch, thus majority of my colleagues and teacher Marek Fornal were interested to take a glimpse of the Sun with smallish Venus inside. The second planet in our Solar System is Earth’s the closest planet, thus during the inferior conjunction with Sun is visible as a very small crescent for eagle eyed observatory and it is definitely visible through the precaution only when crossing the solar disk. For this reason I could impact into this lesson and encourage students to watch the Sun. On the car parking a front of the High School no 5 (Zespół Szkół Ponadgimnazjalnych nr 5 w Krośnie) swimming pool building the physics teacher from our school – dr Andrzej Para was carriying out the observation, projecting the Sun into the big blank board, likewise in primary school in Jasło (Pic.9). The Venus left the solar disk around 13:00. This celestial event was clearly visible for its entirety in my hometown (Pic. 8). Pic. 8 The transit of Venus seen from Krosno between 7:19 and 13:22 (GMT+2) (krosno24.pl). Pic. 9 The transit of Venus 8.06.2004 projected in Primary and Medium School Complex No2 in Jasło leaded by Wacław Moskal (wacek.24tm.pl). Pic. 10 The Sun was almost featureless in 8.06.2004. One visible sunspot no 627 was near solar equator (spaceweather.com). Next transit of Venus was nearly 8 years later on 6th June 2012. I had this transit in mind especially since I bought my first camera in 2006. I dreamed about a small souvenir from this rare celestial event. Once 2012 came I started planning the observation seriously. In that time I was a geography teacher in the Szczepan Humbert Mechanical School no 1 (Zespół Szkół Mechanicznych nr 1 im. Szczepana Humberta w Krakowie). Job as a teacher is specific, because usually you can’t admit on holiday whenever you want. In spite of plenty of days off (more than 35 per annum) you are addicted for a school year, therefore your annual leave occurs during the school holidays (big days, winter & summer holidays, etc.). When you really need some day off in the middle of school year you have to take unpaid leave, which isn’t simple as it looks. First you have to write a request to your head teacher where you must prove a proper reason your leave. Next you need approval from your director. If your head teacher will not approve your unpaid holiday request for whatever reason you have to be at school (work) in this time. I considerated to take 1 unpaid day off on 6th June, in case of bad weather circumstances. The Venus transit in Poland was going to be seen until 7 am so it was a big chance to enjoy this celestial encounter if the weather is fine. Otherwise I was going to leave the Krakow and go someplace with a clear north eastern sky. Fortunately in February the lesson plan had been changed and I gained Wednesday off. 6th June 2012 was Wednesday also so I was very happy. In early June on the week commencement I knew, that some journey will be needed because the weather forecast was fatal. I considerated to go west to Opole or Wrocław where weather patterns were much better. First I though, that I will go to Opole by train, which departed at 23.20. I was looking for someone, who could go to watching this rare occurrence. I found on the astronomical forum, that members from Krakow’s branch of Polish Society of Astronomers Amateur (Polskie Towarzystwo Miłośników Astronomii) are going to see the Venus transit in different part of Poland. Frankly speaking I was very lucky, because Mr Marcin Filipek, the chairman responded for my e-mails in the very last time. Without any contact to him I setted off to Piastowska street, next to junction with Królewska street, approximately vis-à-vis the Biprostal edifice. We were appointed there, I had to wait on the bus shelter. When I came there I realized that will be difficult to meet because of the night, lack of contact and some misunderstanding which would occur. Luckily after maybe 5 minutes came some guy, who declared that he is also going to see the Venus transit with the astronomers group. I felt relieved then. We had not been waiting so long. After maybe 10 minutes, around 0.50 am a white van came and took us first to Jerzmanowice. There astronomers packed themselves gear into 2 smaller cars and we seted off towards better weather conditions. We were headed west. After quick passing by the silesian metropolitan area we proceeded by A4, main polish motorway. Just before Opole, around 3.30 am we spotted the Moon (waning gibbous). Zenith sky became clear, however we went further west because both eastern and western horizon were still overcasted. After next maybe 30 km the sky were clear enough under the glow of forthcoming sunrise, which was fading in. We turned north after 4am and went a few km ahead, where we set up our equipment in the immediate vicinity to the road. The Sun rose at. 4.40 behind remote altocumulus cloud. Venus was clearly visible after the Sun rose a little bit higher than the far, thin cloud layer. We made an excellent observation through 4 items: Telescope Newton 160/1600, MTO-1000 (100/1000), binoculars 20×66 and DSLR camera with 300mm Sigma zoom lens . My equipment was far behind the astronomers stuff. I took a shading glass, 2 pieces of 3,5” disk and compact digital camera only. Pic. 11. Place of our VT 2012 observation, I was taking the picture of the dawn (on the left) and our equipment ready to use, clockwise: Newton 160/1000, Binoculars 20×66, MTO-1000 and DSLR camera with 300mm Sigma zoom lens (phot. Marcin Filipek). Pic. 12 Just before sunrise near Bierzów village. Pic. 13 Waning gibbous and route no 403 on the opposite site. Pic. 14. The Sunrise above Bierzów farmlands, Canon Powershot SX 130 IS, zoom 12x, 4:41 UTC+2. Pic. 15 Venus crosing the solar disk, just after sunrise, Canon Powershoot SX130 IS, zoom 12x. Pic. 16 Venus crossing the solar disk after sunrise with sunspot no 1494, cropped pic. 14, 4:45 UTC+2. Pic. 17,18 Venus crossing the Sun around 1 minute later at 4:46 UTC+2, zoom 12x cropped picture. Pic. 19 Venus crossing the solar disk seen through my hand-made solar filter – double magnetic coated plastic disk, part of the 3,5 inch floppy disk, zoom 12x, cropped picture. Pic. 20. Venus crossing the solar disk near sunspot no 1493 through the Newton 160/1000, 5:12 UTC+2, cropped picture. Pic. 21. Venus transitting through the solar disk with many remarkable sunspots: 1493 on the top, 1494 on the bottom left and 1497 on the bottom right, binoculars 20×66, cropped picture, 5:26 UTC+2. Pic. 22 Venus on the solar disk seen through my shade glass and 12x zoom, sunspot no 1494 on the bottom, cropped picture, 5:37 UTC+2. Because of our location next to the road our group was a point of interest for some people passing by. One guy going on tractor stopped for a while to spot a smallish Venus going across the solar disk. Pic. 23. Venus seen through binoculars 20×66, 5:48 UTC+2. Through the telescope I could see the Venus disk which seemed to be faster than solar one. It was amazing and will not happen again during my life. I took many pictures through the telescope view. Pic. 24. Venus seen through the MTO-1000 (100/1000) with the biggest sunspots also, 6:05 UTC+2. Pic. 25, 26 Venus transit before III contact, zoom 12x, 6:21 UTC+2. Pic. 27. Venus transit before III contact, MTO-1000 (100/1000), 624 UTC+2. The most interesting part of observation was between III and IV contact, when I could see how Venus touching the solar limb. I missed out this in 2004, although I spotted this 8 years later. Pic. 28,29 The transit of Venus, III contact seen through binoculars 20. See als sunspots 1496, 1493, 1497 and 1494 (clockwise), 6:35 UTC+2. Pic. 30,31. Venus on the solar disk seen between III and IV contact through MTO-1000 (100/1000) 20×66, 6:40 UTC+2. Pic. 32,33 Venus on the solar disk seen between III and IV contact through Newton 165/1200 eyepiece, existing chromatic aberration may be misleading in relation to Venus atmosphere, which could be noticed during the I,II or III,IV contact, first spotted by Łomonosow in 1761. Time 6:44 UTC+2. Pic. 34 Venus leaving the solar disk, zoom 12x, cropped picture, 6:45 UTC+2. Pic. 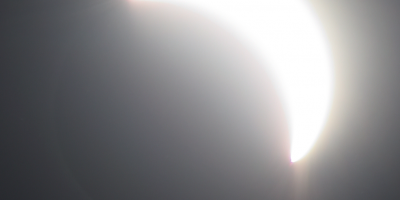 35 Venus leaving the solar disk, MTO-1000 (100/1000), cropped picture, 6:51 UTC+2. Pic. 36. VT 2012 sequence made by Marcin Filipek. Pic. 37. Sunspots on 6th June 2012 – clockwise: 1499, 1496, 1493, 1500, 1497, 1494 and 1498 (spaceweather.com). Pic. 38 The VT 2012 pattern (eclipse.gfsc.nasa.gov). Pic. 39 Last glimpse to the IV contact through the binoculars 20×66. Pic. 40 Our group lead by Marcin Filipek, chairman of the Polish Society of Astronomers Amateur, Krakow branch (phot. Agnieszka Nowak). Around 7.30 we started return to Krakow, where majority of group members used to work. We approached our return destination quickly, around 9.30. There was still cloudy and thick! Basically the weather were worsening east of Gliwice, Sun gone behind clouds in Jaworzno. I am deeply greatfull Mr Marcin Filipek, who freed me to join to his team and enjoy this rare celestial occurrence. In another case I would not gain equal weather conditions in Opole. In the worst option I would go on early morning to the Kosciusko Moud, where lecturer, workig at Pedagogical University, Dr WaldemarOgloza was leading the live stream transmission of the VT 2012 without any chance of a shaft of sunlight at all. We were watching the transit of Venus for a third time as a one of the polish team. Its good to mention, that before 2004 and 2012 transit of Venus was observed in Poland only once! It was in 1761. Second transit of Venus in 1769 was not visible likewise 1874 and 1882. Zawilski M., 2017, Planeta w Słońcu. Obserwacje tranzytu Wenus w Polsce sprzed 256lat! (w:) Urania – Postępy astronomii (nr 3/2017).